Authorized by the Flood Control Acts of 1936 and 1938, actual construction on the dam was begun by the US Army Corps of Engineers in 1960 and completed in 1965. The main purpose of the dam is flood control on the Allegheny River. 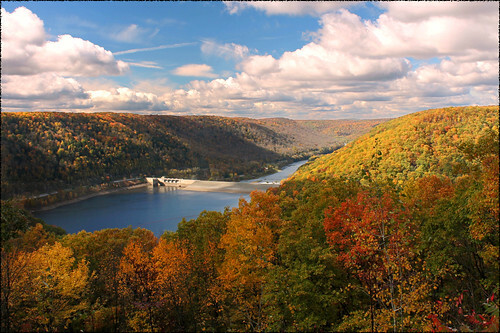 Kinzua controls drainage on a watershed of 2,180 square miles (5,650 km2), an area twice the size of the state of Rhode Island. Side benefits derived from the dam include drought control, hydroelectric power production, and recreation.